Understanding the process of how fragrance notes develop and evolve can help you make a more informed decision when choosing a new scent. When shopping for a new fragrance, chances are you have heard references made to fragrances in terms of notes. Just as a musical note is assigned to the sounds in the music we hear, fragrance notes describe the scent you smell. These notes, whether in music or fragrance, evoke memories and moods that can usually be recalled in an instant. These categories of scents are expertly crafted with the knowledge of how they interact with each other and how they evolve over a period of time. Actually, this process can be thought of as an exact science. Perfumers often refer to the fragrance pyramid when creating fragrances. 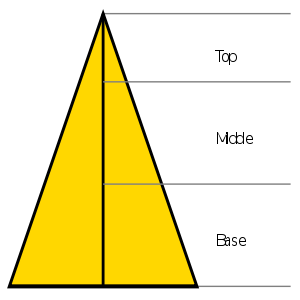 The fragrance pyramid is composed of the three notes (categories) that make up a fragrance and are referred to as the top (head), middle (heart) and base (bottom) notes. The top note is the initial scent that you smell. It is your first impression of a fragrance, usually lasting anywhere from 5-30 minutes. As the most volatile, the top note is made of lighter ingredients, including alcohol, and will evaporate very quickly. From the top note you can get a slight idea about the fragrance and if you are somewhat intrigued but not really sure, allow the fragrance to continue to develop. Common top notes include bergamot, lemon and grapefruit. The Middle note, often referred to as the heart note, develops 10-30 minutes after the initial top note. Here is where you get to “know” the fragrance. It is usually composed of more oils since it will need to last on the skin as opposed to the alcohol in the top note. It is the body or foundation of the fragrance and is usually warmer. It can also act as a buffer between the bottom note which may or may not smell pleasant on its own. Common middle notes include lavender, cardamom, and black pepper. The bottom, or base, note gives the fragrance its weight and slows down the evaporation of the fragrance that has developed after a few hours. This is where the true scent of the fragrance lies once the top and heart notes have evaporated and can last anywhere between 4 to 6 hours, sometimes longer. Common bottom notes include vanilla, jasmine and sandalwood. In addition to the traditional pyramid fragrances, there are some fragrances which are referred to as linear. With a linear fragrance which doesn’t “develop”, one will usually experience a singular note or a group of similar notes at the same time. “Juliette Has A Gun – Not A Perfume” is a fragrance in the linear category. Made of a single element called Ambroxan, it is used in perfumery as a back note.